What is the Firestorm Campaign System? 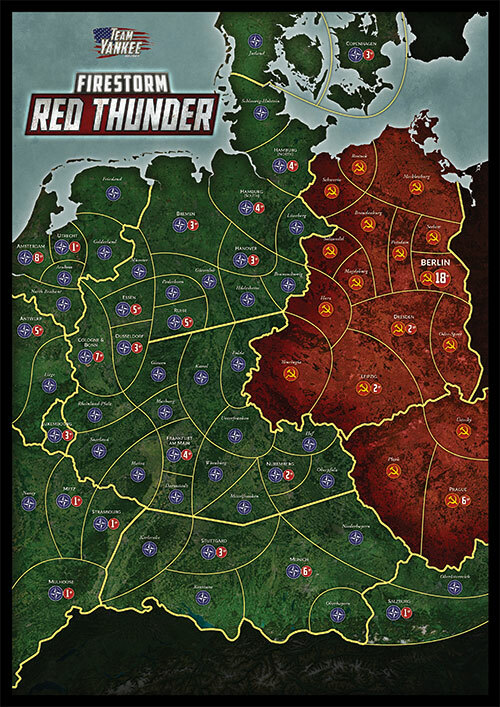 Firestorm campaigns are a great way to gather your local gaming community together to play a series of linked games with an overall objective. Each time that players complete a game, they mark their victories on the map as locations change hands. Once the appropriate number of games have been played, the campaign is over and the side holding cities of the greatest value wins. Each campaign can be played in a single intense day of gaming, or spread out over several weeks. 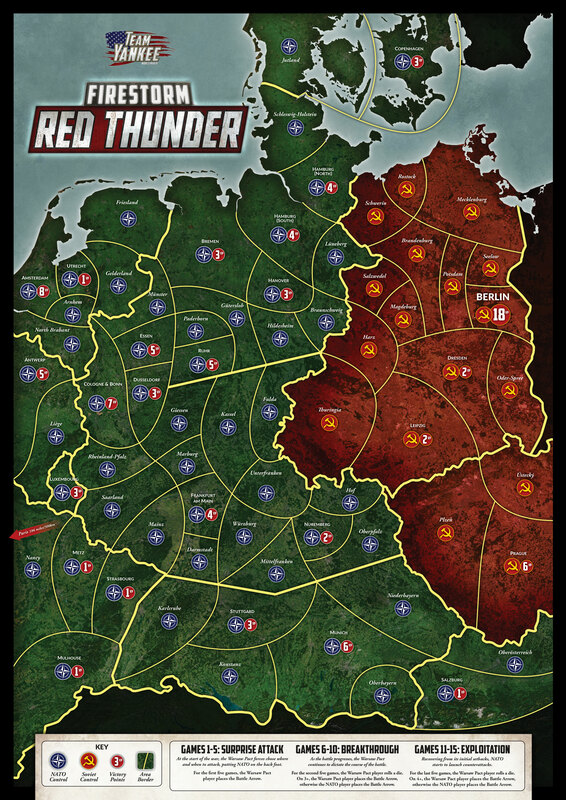 Firestorm: Red Thunder is the first installment of our Team Yankee campaign. The Soviet and supporting Warsaw Pact forces launch a surprise offensive into Germany, seeking to push the NATO defenders back to and across the Rhine River. Meanwhile, the NATO forces attempt to stem the initial Soviet thrust and counterattack to regain lost ground and possibly liberate parts of East Germany. 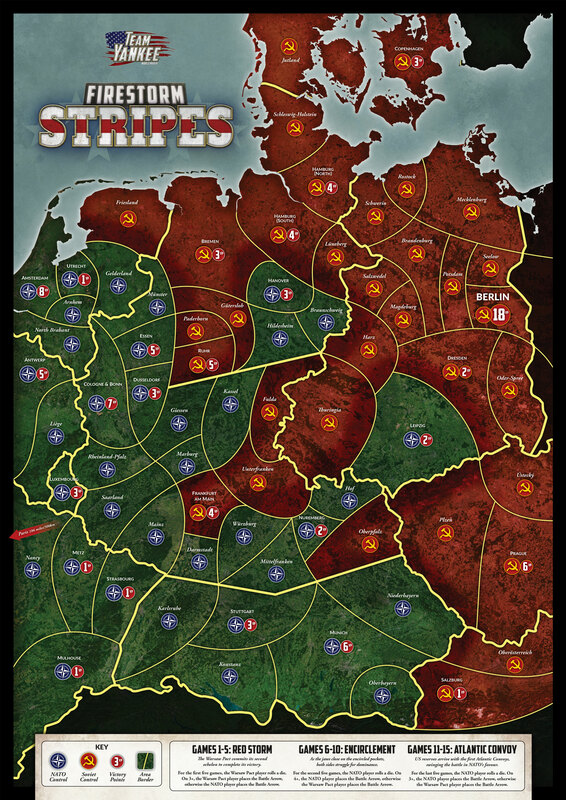 Firestorm: Stripes continues from where the Firestorm: Red Thunder campaign finished. The Soviets have launched their attack, striking across all fronts but the Western Forces have managed to hold them back in a number of areas leaving a pockets of resistance fighting against the Red Tide. It is time now for the Soviet armies to finish the job, or can NATO and it's allies fight the Soviets to a standstill? The original campaigns were designed to be playing using a kit that could be purchased from Battlefront. Using the download version will require a few changes. Victory Pins: Sorry, this was only something that was available in the original printed kit. Battle Arrows: Instead of sticking an Battle Arrow on the map, players can instead just draw a small arrow using a permanent marker. We would suggest having a couple of colours available, one for each side. You could also download the Sticker Sheet and cut out the arrows and adhere them to the map using glue or tape. Number of Attacks Per Phase: There are three phases to the campaign, with each phase having five attacks. Players can simply make a check mark on the map under each phase to keep track of the progress of the campaign. Capturing Areas: Once again we would suggest that players use a permanent marker, or cut out the control markers from the Sticker Sheet.